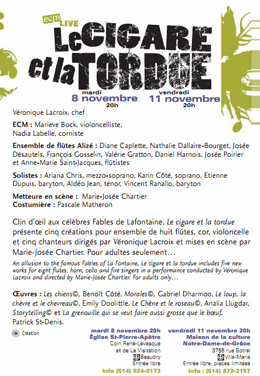 With musical compositions inspired from the themes of Jean de La Fontaine’s Fables, the wolf, the frog, the dog or the lamb, interchange their voices to create a fabulous and unique musical universe. Véronique Lacroix directs 2 musicians from l’ECM+, the flute ensemble ALIZÉ and 5 singers for 5 original creations that illustrate the world of La Fontaine. Composer Analia Llugdar creates from Le chêne et le roseau; Gabriel Dharmoo talks about the morals of the Fables; Benoît Côté reveals the dog under many humourous feats; Emily Doolittle invents a rhythmical trio for the wolf, the goat and the lamb; Patrick St-Denis concludes with the frog who wanted be as big as the cow in a delirious staging.